Topics Include Favorite Childhood Radio Programs, Toys, Food & More. Focus attention and draw clients into fun social situations. Share memories, opinions, support - even laughter. 24" inflatable ball includes a handy activity idea sheet. Our conversation-starting ball is a lively, effective way to focus attention and draw clients into fun social situations. Open-ended questions encourage sharing – memories, opinions, support and even laughter. When the ball is caught, the player responds to the question or statement under his or her right thumb. The Reminiscing Ball covers topics like favorite childhood radio programs, toys, food and more. 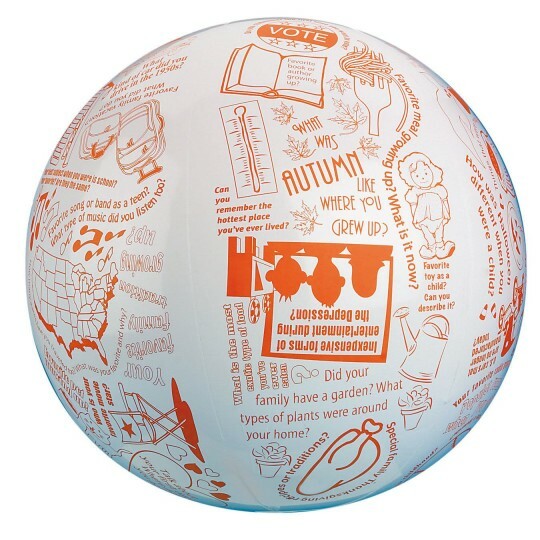 24" inflatable ball includes a handy activity idea sheet. The seniors in this Supportive Day Program love this game! Sharing bits and pieces of your life is healing and often provide lots of enjoyment.This is very successful in our day program. Residents love it they play catch and reminisce. Easy to use and fun to play! This product is great to use at our Social Day Program for seniors and elderly with Dementia Alzheimer's and memory loss impairments. This is great to find new topics to reminisce about and the plus side is that so many of our members enjoy playing ball making them feel like kids again. The only difficulty we have is that many of our members can no longer read or have vision difficulties but that does not stop our staff from being able to assist to keep the game going. Wonderful product which continues to provide new talking points and brings out new stories each time we play. 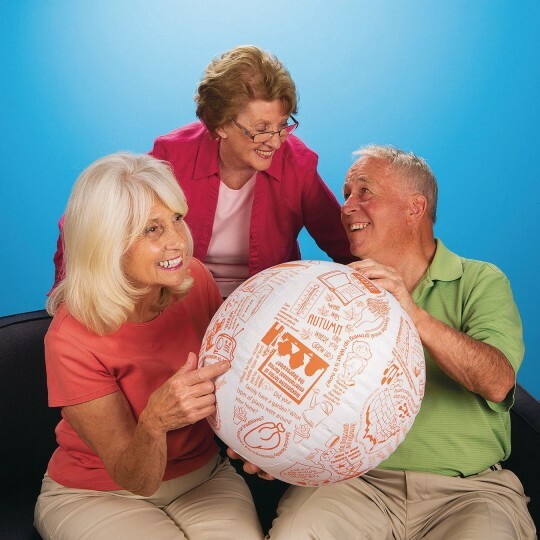 we use it for toss 'n talk activity in a memory care unit!